On Wednesday, 13 September 2017, the campus community of the North-West University’s (NWU’s) campus in Vanderbijlpark inaugurated its newly elected cohort of student leaders for the term 2017/2018. The inauguration ceremony represented a historical occasion as the first-ever Student Campus Council (SCC) was constituted during the event. The SCC replaces the previous Campus Student Representative Council (CSRC) system and consists of 15 representatives. Taking the lead as the SCC chairperson is Thokozani Hadebe, a BA public governance (with law subjects) student and seasoned student leader. He served as the residence officer in the 2016/2017 CSRC. The ceremony saw several high profile speakers taking to the stage to congratulate the new student leaders and to impart important leadership lessons on them. The speakers included: Dr John Tibane, strategic leadership consultant and author, Prof Christopher Rabali, representing the office of the deputy vice-chancellor for Vanderbijlpark, Prof Lumikile Lalendle, executive director for student life and Mr Jacob Simango, director for student life in Vanderbijlpark. The outgoing CSRC chairperson, Lesego More, acted as the programme director. In his first address as SCC chairperson, Thokozani thanked his parents for their continued support and pledged to make them proud during his term as student leader. He furthermore emphasised the importance of community involvement and encouraged his fellow student leaders to vest a culture of continued education – as a viable solution to overcome social ails such as poverty and unemployment. * Before the commencement of the inaugural ceremony the SCC representatives together with their parents enjoyed a lunch with Prof Linda du Plessis, deputy vice-chancellor of the campus in Vanderbijlpark. 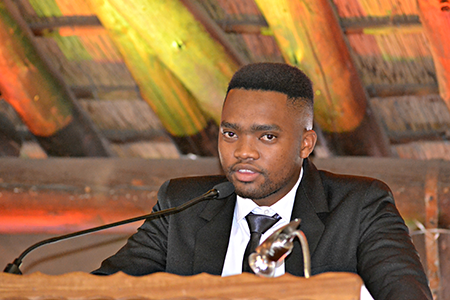 Thokozani Hadebe is the chairperson of the first-ever Student Campus Council on the NWU’s campus in Vanderbijlpark.